The video above presents biosensors for a medical application, specifically the detection of glucose levels in diabetes patients. Biosensors are a very complex but new and exciting field in the biotechnology realm. A biosensor is literally defined, according to London South Bank University, as an analytical device that converts a biological response into an electric signal. This means that biosensors measure a biological response such as greater gene expressions, or greater concentrations of certain proteins or chemicals in living organisms, and this measurement is then converted into an electric signal which the microchip can read and process. The data is then either reviewed by a scientist/doctor or can prompt for another type of chip in the body, such as a prosthetic body part, to perform another action based on the data collected. Who is responsible for creating the idea of biosensors? Biosensors were first hypothesized and tested by a man named Professor Leland C Clark Junior. Professor Clark published a paper in 1956 that discussed his oxygen electrode concept. 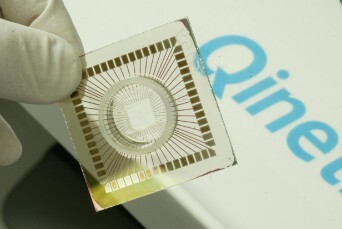 The oxygen electrode entrapped glucose oxidase using a dialysis membrane, and the chip then detected the changes, according to Professor Anthony P F Turner of Cranfield University. Professor Leland C Clark’s work is recorded as the first attempt to use a electrical based computer chip to detect biological processes in living organsisms, hence he is credited for creating the first prototype of a biosensor. Professor Clark later went on to address a New York Academy of Sciences symposium and he believed that these new biosensors could be expanded and could be used to measure a huge assortment of chemicals and other processes in the body. Today, Professor Clark’s work has been expanded upon in great depth. No doubt the emergence of the digital age has prompted scientists to use more sophisticated biosensors, but the basic concept of measuring biological processes has remained largely the same. As integrated circuits began to get smaller and smaller from the 1960’s until the present, biosensors have been made on a nanometer scale and can be inserted into actual organisms instead of determining chemical changes outside of the body, as Professor Clark’s experiment dealt with due to the lack of microscopic chips. Biosensors, today, are used for a wide variety of applications. How can biosensors be applied? Three important fields of biosensor applications include environmental, medical, and industrial uses. Environmental applications include detection of unwanted chemicals in municipal drinking water, such as pesticides and/or river water contaminates and certain airborne chemicals that may be too concentrated in a certain area for a living population of organisms. Industrial applications include using biosensors to detect structural changes in the products that make up buildings. By far however, the largest field for biosensors is the medical field. Biosensors have already been tested to discover cancer in its earliest stages, or determine levels of crucial nutrients that must stay in equilibrium in our bodies such as oxygen, carbon dioxide concentration, etc. Biosensors have been used with diabetes patients to determine insulin levels in the pancreas and thus determine when levels become too high or too low. This application dealing with diabetes is of great important because no longer will diabetes patients have to use blood insulin level checkers, that rely on a patient’s memory to remember when to check and other difficulties, but rather biosensors would relay when the correct time to increase or decrease insulin levels, without the need to use a blood insulin monitor. This saves time and ensures realtime insulin injection to keep blood sugar levels stable and provide less stress on the pancreas. Major challenges to this area of biotechnological research include availability and insufficient testing. Biosensors are not widely available yet and thus have not been tested on humans sufficiently. Scientists have a huge task before a sensor is complete. Great amounts of time involved with programming the chips, determining the correct biological sensors to use, and fixing bugs in the software are necessary before a biosensor product can begin testing in human trials. Scientists currently do no know the safety of biosensors in a human application, and do not know whether the sensors will be rejected by the body or if the electronics inside the body will have ill effects, etc. However, regarding industrial and environmental applications, biosensors should not have much difficulty because huge amount of tests are not necessary, unlike the medical field. Biosensors will not likely disappear from the scientific spectrum in years to come. Quite the opposite will likely happen; Biosensors will likely grow exponentially in the years to come as society becomes more connected digitally and as computers are able to better process huge amounts of information that the countless numbers of biosensors will likely create. In the coming years scientists will focus their attempts, regarding the medical field, on adequately testing biosensors in humans and making biosensors commercially available. Scientists will try to monitor the human body in all aspects: livers will be monitored to make sure enzymes are functioning correctly in filtering out toxins, hearts will be monitored to determine when heart attacks may occur, cancer will be detected in its earliest stages and individual cancer cells may even be killed using another portion of the sensor. Indeed the body will be monitored constantly to determine possible health concerns that may arise. Despite all of the great advances expected to come, bioethical and fearful questions still arise.